"Audio Frequency Analyzer" is a powerful Real-Time Audio Analyzer (RTA) app for iPhone. This app can measure the frequency response in 30 split band scale of 1/3 octave in realtime. Also it can be displayed the FFT analysis result. In the latest version, the 1/3 octave band calibration is available. By adjusting the characteristics according to the external microphone used, high accuracy measurement can be realized. "Audio Frequency Analyzer" is available in a variety of applications, such as sound room tuning, speaker settings, audio equipment testing, stage setting measurement, evaluation of sound mixing environment and Investigation of noise environment. 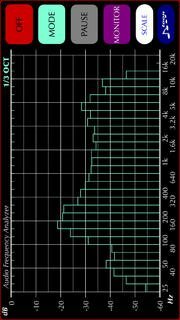 Function of Touch-Scroll to adjust visible amplitude ranges. Supports built-in microphone, headset microphone, and external digital audio connection. The authorization for access to the built-in microphone will be confirmed by the iOS system at first boot. Please enable access to the microphone. TOON,LLC is a company that seeks the comfort of sound environment based on our acoustic proprietary technology, and we will provide tools for audio professional, sound technology, home theater installer, and anyone who loves audio.